SDPD said they suspected a burglary was in the works when they watched two brothers unlock the door to their family store, where they also lived. Officers punched and handcuffed members of the family. Video footage disputes key details offered by the cops. Last July, Luis and Diego Lobaton were returning to their family’s store in City Heights after sneaking a late-night cigarette. They expected a rebuke from their mother. A mother’s upbraiding turned out to be the least of their worries. As the brothers, along with Luis’ girlfriend, walked back to the store from up the street, they were followed by two San Diego police officers. Four more officers soon joined the scene. 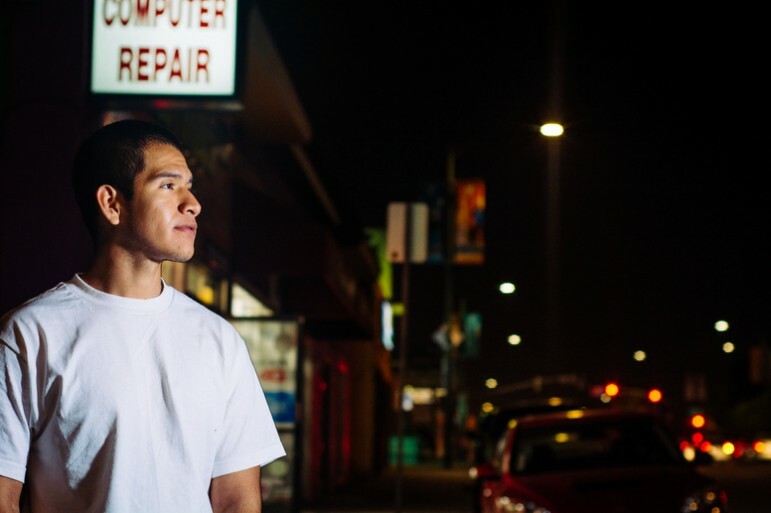 In a brief but violent encounter, Diego was handcuffed and detained as he opened the door to the store, and Luis was punched repeatedly by an officer who barreled inside with other cops and arrested him. Hedy Julca, the Lobatons’ mother and the owner of the store, tried to get between two officers who were pounding on Luis Lobaton. An officer wrestled her to the floor. She, too, was handcuffed and arrested as another son, 3-year-old Bruce, watched from close by. The July 29, 2014, scuffle was over in about a minute. But its impact has been long-lasting for the family: Julca and the toddler are in therapy, Julca said. Luis Lobaton said he has suffered from memory loss and neck pain. Police spokesman Lt. Kevin Mayer confirmed the department is conducting an internal affairs investigation over the incident, but declined further comment. Attorney Randall Hamud filed a claim for unspecified damages on behalf of the family on Jan. 14. A claim is usually a precursor to a lawsuit. The Police Department has faced numerous charges of officer misconduct in recent years, and a federal review of the department’s misconduct policies is due later this month. Police Chief Shelley Zimmerman has instituted reforms aimed at cracking down on misconduct, including outfitting officers with body cameras. The family says that the officers weren’t wearing them the night of the incident; SDPD would not confirm whether any of the officers were wearing them or not. The family’s business, Lucky Star Mobile, is located next to an alley on a stretch of University Avenue lined with small businesses whose owners represent a melting pot from across the globe. The family doesn’t just run the store, they live there too – the back of the store is a living quarters. Luis and Diego Lobaton were living there at the time. Julca and the others, including the toddler’s father, were home that night, watching television in the retail area before officers arrived. A report filed by Officer Kelvin Lujan said that he and his partner, Officer Sam Euler, were patrolling the 4600 block of University Avenue when they saw Luis Lobaton, 21, and his girlfriend, Emily Fajardo, 18, strolling on the sidewalk. It was about 10:30 p.m. and the pair raised the cops’ suspicion, though the report doesn’t say why. Their suspicion was fueled further when Lobaton unlocked the front door to the store, which was closed, and the couple went inside. The police reports say officers sensed that Lobaton and Fajardo were engaged in a commercial burglary. According to Lujan’s report, he was standing outside the store, suspecting that a burglary was in progress, when Diego Lobaton, 20, walked up and in front of the cop “attempted to enter the business.” Lujan acknowledged that Diego Lobaton said it was his brother who had walked inside. The version of what happened next that is spelled out in officers’ reports and the version told by members of the family differ wildly. But several surveillance cameras inside and outside the store captured the incident and appear to largely back the family’s version of events. • One officer says in a report that Diego Lobaton, who had a key to the store in hand, “attempted to lock the door” to prevent police from going inside. The surveillance video shows otherwise. On the video, a copy of which was provided to Voice of San Diego along with police reports by the family through their attorney, Diego Lobaton is seen arriving at the store less than a minute behind his brother. Lujan, the officer, walks into the picture and begins talking to him as he unlocks the door. Diego Lobaton pulls the door open, and Lujan nudges him away. At about the same time, Julca’s 3-year-old son is seen on video inside the store, running to the opened door. (The child be seen on the second video below, from about on 7:28 to 7:58 on the video player, or from about 10:28:53 to 10:29:40 according to the clock at the top of the screen.) The boy is not mentioned in any of the reports. • Officer Michael Usrey says that at one point Julca “grabbed [the door] and pulled it shut” while Lujan was trying to talk to Luis Lobaton inside. The video doesn’t appear to show Julca holding the door shut, though she may have closed it at some point. But the video does make it clear once Julca opened the door to speak with Lujan, another officer held it open until the cops rushed inside. The family, of course, disputes that. “I told [Lujan], ‘This is my business.’ I told him Diego had a key to the store. How could he be robbing the store? I told him Diego and Luis are my sons,” Julca said. 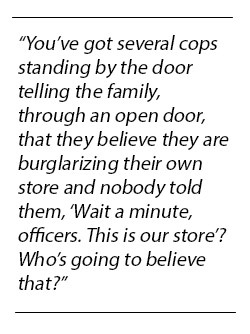 “You’ve got several cops standing by the door telling the family, through an open door, that they believe they are burglarizing their own store and nobody told them, ‘Wait a minute, officers. This is our store’? Who’s going to believe that?” said Hamud, the family’s attorney. Luis Lobaton swung at him twice trying unsuccessfully to hit him in the face, said Lujan. The video shows that Luis Lobaton was inside the store, with his mother standing in front of him, and officers outside on the sidewalk. Luis Lobaton’s left arm is extended, and he’s holding an object with a light, presumably a cell phone, in front of his face. Lobaton said he was attempting to record the interaction on his phone. Lobaton does not appear to swing or lunge at the officers in the video and actually appears to be backpedaling when an officer rushes inside and begins striking him. Beyond videos casting doubt on officers’ accounts of any aggressive actions by Luis Lobaton, there’s another reason the police version doesn’t make much sense: Luis Lobaton said he has had a brain tumor since he was a child and getting in a fistfight with a cop, or any situation that might invite blows to his head, was the last thing he wanted to do that night. Julca said her son had to stop playing sports because of the tumor. • One report says Diego Lobaton told officers that his brother Luis was a gang member. “They were trying to make me admit that he is in a gang, and they were trying to make me say that I understood why they thought Luis was a burglar. I told them that I couldn’t understand why they roughhoused my brother and why they yanked my hands up behind my back. That hurt,” Diego Lobaton said. Luis Lobaton and Julca were charged with assaulting an officer and resisting arrest, but those charges were dismissed. After she was driven to the police station, Julca said she was kept handcuffed in the back of a patrol car for about 40 minutes. “Some of the officers who had been at the store were standing outside and laughing. I heard one of them say to the others, ‘What are we going to put in the report?’“ Julca said. Although the charges against Julca were dropped, her legal problems are not over. Julca, a Peruvian citizen, is facing possible deportation. She is in the country illegally and returned after agreeing to a voluntary removal when apprehended about 10 years ago. She was turned over to U.S. Department of Homeland Security officers after her release from La Colinas Detention Facility and has hired an immigration attorney. Luis Lobaton, tattooed and wiry, is no stranger to the criminal justice system. He is awaiting a preliminary hearing in February for a 2012 burglary charge and is free on bail. He said he’s had contacts with police since he was a juvenile, and at one point belonged to a Clairemont tagging crew. In October, he pleaded guilty to a misdemeanor count of resisting a police officer in an incident stemming from an argument with his girlfriend. Authorities said he was belligerent and aggressive with the officer. A more serious charge of using physical force on an officer, a potential felony, was dismissed in exchange for his guilty plea to the misdemeanor count. He received probation and a fine. On July 28, the day before the incident at the family’s store, two officers detained him at the El Cajon Boulevard tire shop where he works. He was handcuffed, questioned and detained in a patrol car but released at the scene. In a cell phone video recorded by a witness, an officer said Lobaton matched the description of a suspect they were looking for. Almost five months after the July incident at Lucky Star Mobile, police returned to the store on Christmas Eve. Five officers again followed Luis Lobaton inside. Julca said they told her he was acting suspicious. SDPD said it would look into this incident, after an inquiry by Voice of San Diego. Fortunately, though, the December encounter between Luis Lobaton and police was peaceful. He was questioned but not arrested. H.G. Reza is a freelance contributor to Voice of San Diego. He worked at the Los Angeles Times for 25 years, covering law enforcement and terrorism.